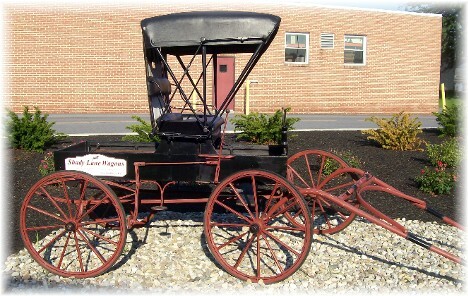 This interesting carriage sits in front of the Shady Maple Farm Market and advertises Shady Lane Wagons, a local buggy dealership. "Lessons From A Broken Axe"
Yesterday I bought a small hatchet to clear some brush and remove some enduring roots from cut down bushes shooting up through the ground. Now anyone realizes a hatchet can be a dangerous tool, especially if the head falls off or if we lose control of the handle or miss our aim, but surprisingly this is the single warning on the packaging: "This product contains chemicals known to the state of California to cause cancer and birth defects or other reproductive harm." A hatchet is essentially a handheld hammer-like axe which brings to mind a story in the Bible concerning an axe head. Elisha's school of prophets had gone down near the Jordan and were building a place to live. It was a cooperative effort with each cutting down a tree for the project (sort of like a barn-raising). Today I want to consider the unnamed prophet's sense of personal responsibility and stewardship; "Alas, my master! For it was borrowed." He was distressed that he had lost something belonging to another. On Memorial Day weekend our neighbor's barn blew down. It was right alongside one of our favorite spring trails and I had taken photos several months earlier. The neighbors asked if they might have copies of the photos. 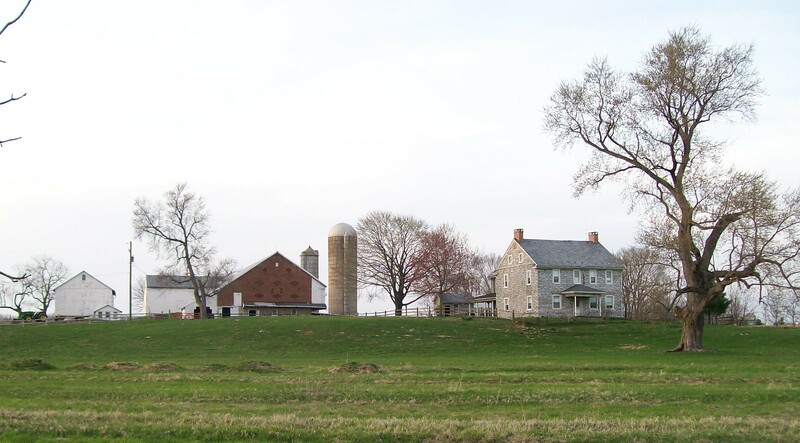 After all, who would have expected a brick barn built in 1815 to blow over! I placed several of the photos on a thumb drive so they could select the ones they wanted and then print them at whatever size they chose. Last night their young son, Jandon, rode his bike over to our place and returned the thumb drive to me. A few minutes later his mother came by and verified that I had indeed received the drive and they both individually apologized for keeping it beyond the time originally planned (though we had given no thought to the time span and had even forgotten about the drive). How good it is to have parents who model and teach responsibility to their young children which is so important for the next generation. That in itself is a commendable lesson for today and so needed in our careless society. But I want to consider a deeper level of responsibility and stewardship; our stewardship to God. Essentially stewardship means using something belonging to another. Our very lives are essentially on loan from God. Job shared this perspective that all believers should express when dealing with the variables of life, "The Lord gives and the Lord takes away" (Job 1:21). Paul had this outlook concerning ministry: "Let a man regard us in this manner, as servants of Christ and stewards of the mysteries of God. In this case, moreover, it is required of stewards that one be found trustworthy" (1 Corinthians 4:1,2). The prophet's distress over losing a part of the borrowed axe is commendable but let us consider today, in a far more extensive sense, that which God has entrusted into our care! Are we using it properly, sharing it generously, and dedicating it to God's service? Daily prayer: Father, may we be found trustworthy in our relationship to you and others. Help us as we seek to understand and communicate the teachings of Scripture so that we are faithful stewards of all that is entrusted to us. In the name of Jesus we pray. Amen. We enjoyed watching this persistent goldfinch cling to the sunflower upside down for a very long period of time this morning. Brooksyne hasn't been feeding the birds lately so they have to work a little harder to get their seeds. 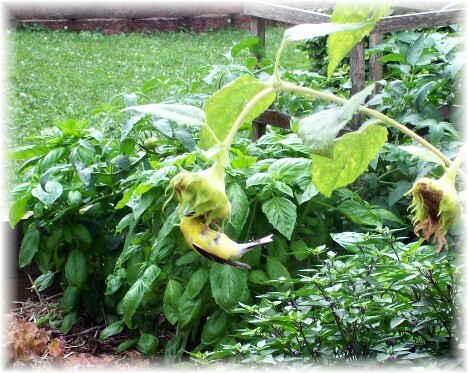 In fact, as they do every summer, they plant their own sunflower plants from droppings from their bird feeder - it's a good thing this finch might be thinking!! 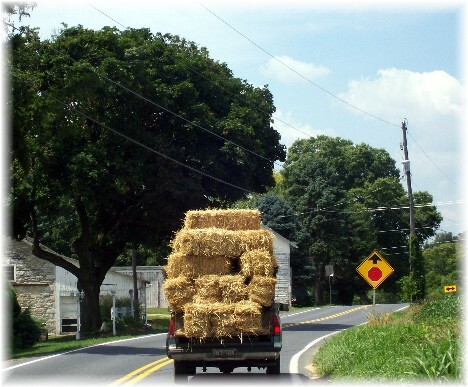 We followed this pickup truck over-loaded with hay the other day on Donegal Springs Road. Now I suppose there's nothing especially interesting to most about this but for me it brings back some memories. When we first got married in May 1976 I worked that summer on a large hay crew that custom harvested on farms north of Springfield, MO. Correction: Yesterday Brooksyne incorrectly stated that Greensleaves was the tune for "He Looked Beyond My Fault" and the Getty song. Later she realized (thanks to me) that Greensleaves is the tune to "What Child is This", not the other songs mentioned. We had a chuckle but wanted to set the record straight. 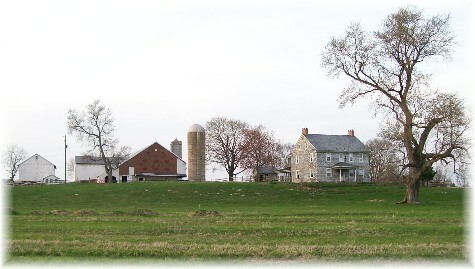 Photo of 1815 barn referred to in today's message. Photos of the barn after it blew over. Photos of the new barn being built in a new barnbuilding. Shady Lane Wagons A dealership I suppose very few of you have in your area!